Read the recommendation here or below. 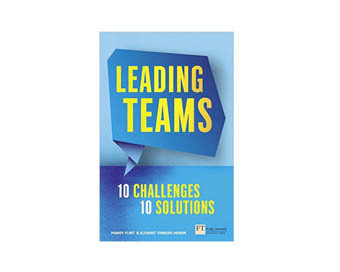 Synopsis: It highlights the ten most common obstacles teams face, and provides simple, effective strategies to enable leaders to overcome them. Working as a team is something almost every one of us will have to do at some point in our careers, but all too often there are roadblocks – ranging from lack of communication to clashing personalities – that get in the way of the many benefits of teamwork. Crucially, it falls to leaders to get things back on track and create an environment and atmosphere where positive results can be achieved, so help is at hand from an insightful new book, Leading Teams which highlights the ten most common obstacles teams face, and provides simple, effective strategies to enable leaders to overcome them. The authors, Elisabet Vinberg Hearn and Mandy Flint are both highly sought after leadership consultants who work with top brands like MasterCard, American Express, Virgin Atlantic, H&M and IKEA to help them increase employee engagement, transform organisational culture and improve efficiency. The book draws on their experience of working with over 200 teams at some of the world’s leading brands to highlight the most common challenges in leading teams, revealing fascinating insights that are applicable to businesses of all sizes. People are of course the most important aspect in any team, so as well as outlining problems and solutions; Leading Teams focuses on the human element to look at behaviours of teams and leaders and the impact issues might have on their thoughts and feelings. The very simple solutions are designed to work with teams to create a positive change in team dynamics that will have a ripple effect throughout an organisation. Leading Teams is structured in a way that makes it very easy to approach, simple to understand and practical to implement. By addressing specific challenges in each chapter, it provides a “go-to” resource that business owners and managers can refer to when faced with one of the issues that have been shown to come up time and again.